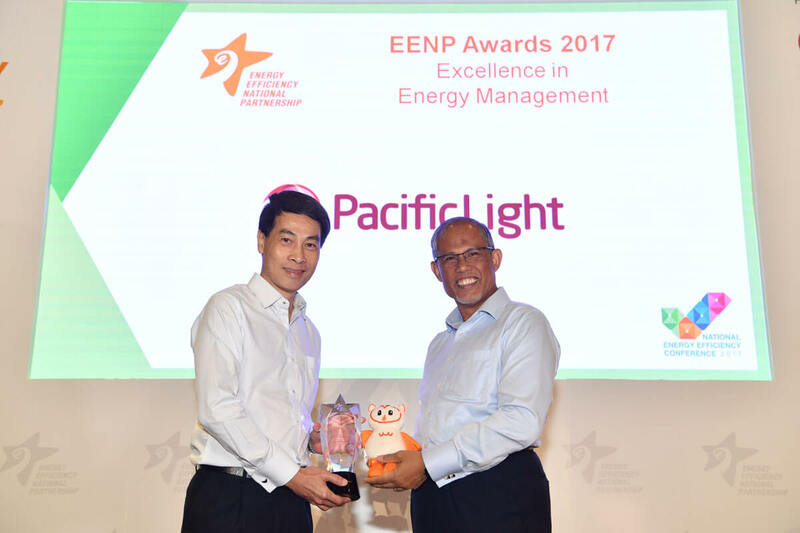 Singapore, 5 October 2017 – PacificLight is proud to have received the Energy Efficiency National Partnership (EENP) Award for Excellence in Energy Management, which recognises the company’s continuous pursuit of energy efficiency. Organised by the National Environment Agency (NEA), Energy Market Authority (EMA) and the Economic Development Board (EDB), the EENP Awards aims to foster a culture of energy efficiency and encourage companies to adopt a proactive approach towards energy management. “PacificLight is honoured to be selected as one of the winners in this year’s EENP Awards. It provides clear affirmation that our efforts in energy management and efficiency are in line with the NEA’s best practices in energy conservation. Our success is testament to our staff who provide the drive and commitment to implement our efficiency projects,” says Mr Yu Tat Ming, CEO of PacificLight. Over the past two years, PacificLight has spent more than S$5 million on plant enhancement measures, focusing on efficiency and a reduction of its carbon footprint. The energy saved is equivalent to the electricity used by 10,000 Singapore households. One key initiative was the implementation of a variable speed drive (VSD) for the feedwater pumps in PacificLight’s power plant, making PacificLight the first in Singapore to adopt a VSD in a power plant. The project resulted in a 50 percent reduction in energy consumption – enough to power more than 2,200 local households. As part of its commitment to energy conservation, PacificLight holds regular internal energy symposiums where employees share recommendations on energy management – from improving plant performance to reducing in-house consumption.